The first Fiat 500, commonly known as "Topolino", is an Italian city car produced and manufactured by Fiat from 1936 to 1955. The name "Topolino" translates literally as "little mouse". 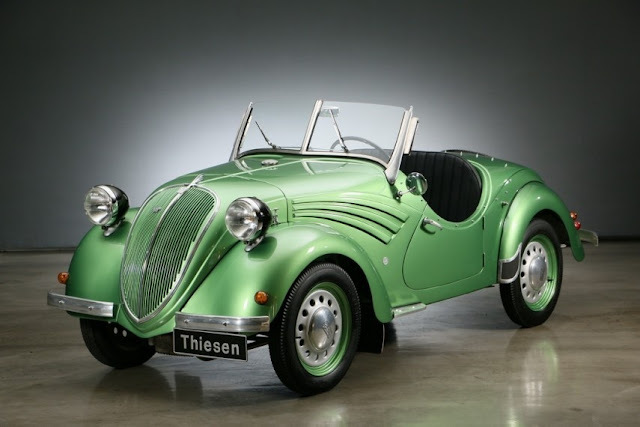 Launched in 1937, three different models were produced: The 500A Series was available as a Salon and as 2-door van, as well as a four-seater Cabriolet- Limousine (from 1939) and last not least as a Roadster by the German coachbuilder Weinsberg. All models were available with a folding roof. The engineer Dante Giacosa was the designer of the Topolino. This Fiat 500 A Roadster represents a unique opportunity to purchase a rare Topolino with a German roadster body by Weinsberg. The car is completely restored and exceptionally original! Contact Thiesen Hamburg GmbH for more details.